Renowned seaworthy, seakindly yachts with sparkling performance, able to sail close to the wind, an extremely responsive yacht. Solo circumnavigaters in these boats include Jon Sanders, '81-'82, David Hicks, 96-97, Jesse Martin, 99-2000, and our favorite Jessica Watson. 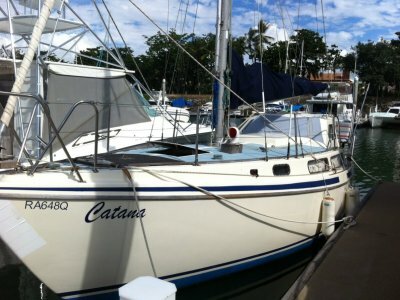 An ideal easily handled cruising yacht, they have also had many racing success's, including Sir Edward Heath winning the Sydney Hobart in 69, in the first british built 34, and further wins in the Fastnet race, Parmelia races, the 96 Lord Howe. 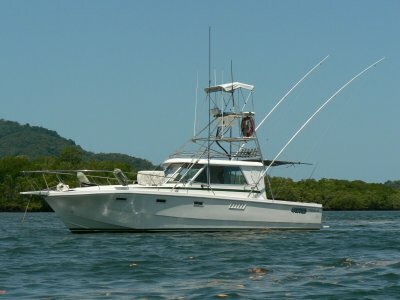 These are a class, classic yacht still being built today with the proven pedigree of Sparkman and Stephens. 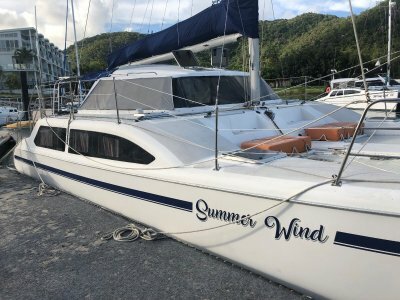 This boat was built by the respected Townson in NZ, and has been well maintained and constantly upgraded regardless of expense by the current owners. It is Auistralian registered and ready to go. 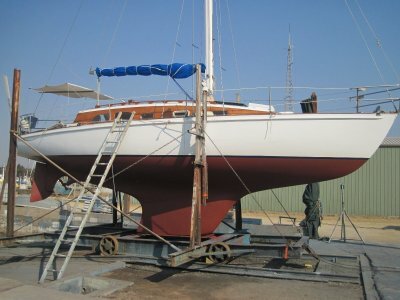 In Australia we are accustomed to the locally built boats which had the cabin trunk modified to a single plane, but the stepped cabin is as Olin Stephens drew the boat. Double v berth forward, quarter berth, setee berths, with lee cloths, beautifull drop leaf table in selected timbers folds up against bulkhead opening up saloon area. Kero cabin heater, enclosed head, new cockpit cushions. L shaped galley with near new metho stove, stainless sink, good storage, eutectic refridgerated ice box under nav table. 406 epirb, flares, 2 x fire extinguishers, manual and 12v bilge pumps, plus new spare pump, 4 man life raft, life jackets etc. 2 x 100AH gel batteries, 110amp alternater on engine, s x solar panels, smart regulater, bow thruster, fans, nav and cabin lighting. Near new 16 mile JRC radar, VHF transmitter, Navman wind instruments, Navman depth sounder, Navman 5600 gps/plotter, ST2000 tillerpilot, compass, good compliment of charts. Self tailing bronze sheet winches, halyard winches on mast. 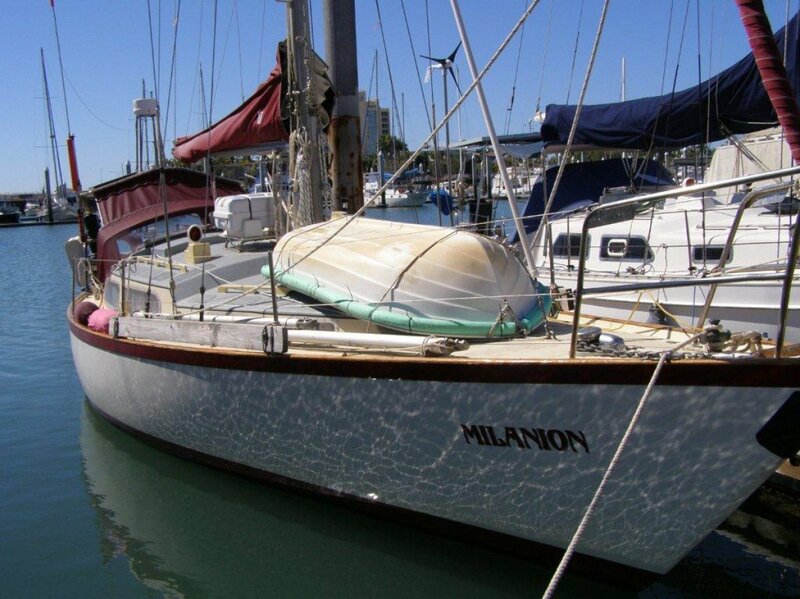 This boat is responsive and easy to handle, sails beautifully and is in rmarkably good overall condition. Very well equipped and ready to go anywhere. Quality boat with a pedigree. Inspect now.